So far i've used this blog to promote my experiences, mainly with Big Finish, but of all thing's i've enjoyed and thought noteworthy. On the internet exposure is everything so i've just been reiterating aloud my love of these products to give them a little more shelf life. 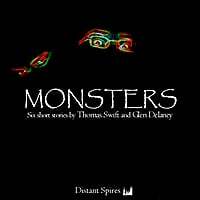 http://www.distantspires.com/ is a website I have prepared in collaboration with another author (Glen Delaney) in order to publish audiobook short stories. This summer we intend to release a collection (Monsters) which will feature six original short stories. The website should go live today and a short audio trailer for all six stories has just gone live on youtube and soundcloud. We intend to sell these for download over the internet at a very cheap, reasonable price. This isn't specifically a profit organising website, we aim just to cover the cost of putting them online but if you do purchase them it will allow us to write, record and publish more over the coming years. Please, check the website out and enjoy. And follow our website specific blog http://www.distantspires.blogspot.com/.